These speakers make the most out of DVD movie special effects. Direct/Reflecting speaker technology provides a wider, more natural soundstage, making even a small room seem bigger and more spacious. And of course you get renowned Bose quality. BoseÂ® 301Â® Direct/ReflectingÂ® stereo speakers convey the power of a live performance, yet are small enough to fit comfortably on a bookshelf or in an entertainment center. 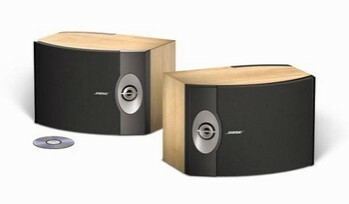 These versatile, elegant speakers bring lifelike, spacious sound to music and movies and are an excellent way to bring Bose sound to your stereo or home theater components. They produce clear sound using an Asus essence Stx 7.1 soundcard and cheap Pyle amplifiers. Taken into consideration of the cheapness of the amplifiers not being able to get what is needed out of these speakers they work pretty well. Will soon be installing crown 1502 to power these speakers. The weakness is maybe a too little of base, and the 75 watt continuous limit at four ohms. I bought Bose 301 since 2006 until now it sounds great paired to my Denon AVR 1508...and currently I was upgraded using the latest 9.2 Denon AVR -X6200W with Bose 301 as front wide speaker and it performs so incredible sounds experience about movies.music and videoke performance...I love Bose a genius speaker. I just tick the bpxes above so I can proceed my question to be posted on this review. I am planning to buy bose 301 series V. Does this speaker can go down using a 100 or 130 watts RMS amplifier with out distorting its sound? Or do I need to buy 300 watts RMS amplifier to match this speaker? Does anyone can answere my question please.. I just bought these. or at least it seems that way as they constantly surprise me with the clarity and sound stage they produce. These speakers are along a 15' well, about 8' from me and they just fill the room with sound. As a Mass resident, I was shocked when I called to ask a question and an American operator from 15 miles west of me answered. The accent was easy to pick out. For years, I was a brute force guy, horn loaded speakers and tons of them. This made for a loud if not always pleasant sound. 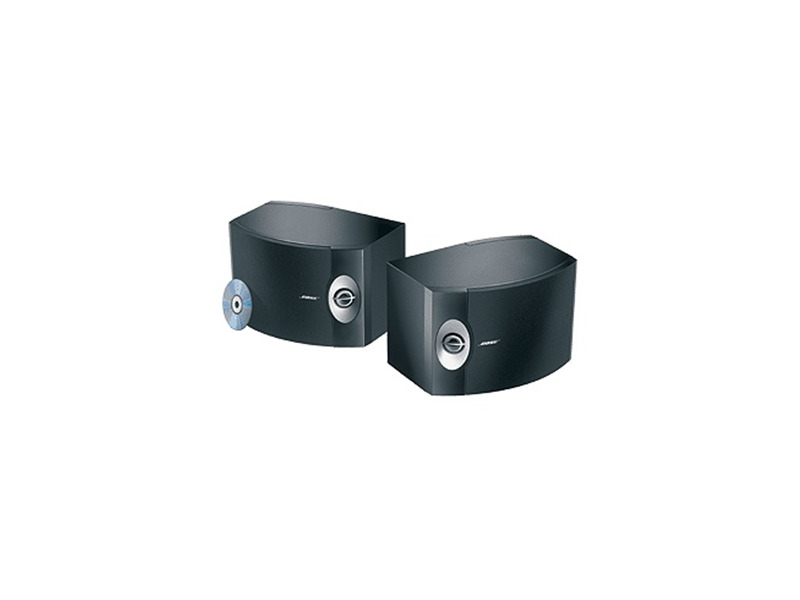 The 301's on their Bose stands really sing, they have a light, airy and spatial sound. They sound nice. No, they don't compete with my big horn boxes for deep bass, but they present an overall balanced sound. Again, the sound stage is really impressive, bringing spatial qualities to music, television and most important gaming than my old horn loaded stuff could, which had really strict placement requirements and a small sweet spot. Again, they bring a nice, spacious sound and they sound great at all volume levels. Even comparing the sound of a pair of $1600 a piece speakers, these little guys come out on top. All speakers have a sound quality, I would describe these as life like with a tremendous sound stage. All of that for $328 a pair, not bad Bose. A darn good speaker for a great price, Folks bashed Bose for so long, and even though I was about 7 miles west of a Bose showroom and 10 miles from corporate HQ, I never listened. For years I've been listening to horn loaded speakers, which after a while started giving me a headache. The combination of good crossover technology, some trick direct/reflecting technology make for a really pleasant sounding speaker. Okay, they aren't my Cornwall's, but for a week I had them mounted on my Forte II's until I assembled the stands, what can I say, the present a great sound stage and no headaches. No, they can't rattle the room like the Cornwall's or the Forte II's but they present a really pleasant sound stage without the directional beaming of some very high priced stuff. The 8" woofer can go deep like the Forte II, but they do enough to make things sound good. with a great sound stage and pretty good balance all around. The sound stage makes them seem like music is all over, not just on axis. The sound stage makes them sound bit and omnipresent. It's kind of cool. I used to get headaches after an hour of listening, now, I experience no listener fatigue, no ringing in my ears after an hour. Look, I Bose bashed like every other hater out there, but one day, I went in to look for smaller speakers for my room, the 301's were set up on their stands and sounded great. tonal balance was good, dynamic range is part speaker, part amp. I use a Yamaha receiver with 105 watts per channel x 5, although I'm in stereo mode and all is good. For anyone interested, these speakers are replacing a pair of Heresy II's, no, they're not as loud, but I don't get listener fatigue after an hour, a real test of a good speaker. They look really cool on the stands, way more decorative than my old Heresy II's on stands. What you buy is up to you, but I was looking for a replacement, I searched high and low and I found these little Bad Boys, they are good. The over all tonal balance and sound stage make them worth the money, in fact they are replacing speakers that now cost $1600 a pair. I'll do my best to accurately rate this speaker system. I purchased the pair from Bose a few weeks before Christmas in hopes that they would be comparable to my klipsch SB2. I have the 301's connected to a Denon 1708 reciever. I have had the chance to compare several different recievers so I know the Denon 1708 is a fairly bright sounding unit with more focus on midrange / high frequency. High frequency from the Bose 301 can be overwhelming with the Denon reciever. To balance the tones without any major peaks I have to turn the treble down quite a bit. I also have had to turn the bass down a few notches to balance with my Velodyne CHT8 subwoofer. I have the x-over in the reciever set at 110hz and have found that it blends very nicely with the bose 301's at this setting. In comparison to the klipsch........I have mixed feelings... IN MY OPINION I prefer the flat response of the klipsh SB2 over the Bose 301, however that is using the Denon 1708. A different reciever will create a different sound! The Bose 301 and an Onkyo 602 is a completely different sound... Overall I am satisfied with the Bose 301 and do not regret the purchase. Sound stage is quite large! (larger than the Klispch SB2!) I have removed the drivers in the Bose 301 for inspection and was not shocked. Bose is not your typical speaker company. Connections and capacitors are different and would appear to be a "cheaper" component compared to the normal crossover you will find in high end speakers. It works for them so they should continue with it. I can tell you the Klispch SB2 will play MUCH louder without distortion than the 301's and in my opinion it is due to the crossover used in the Klipsch. Woofer quality in the bose 301 is good. They use a simple paper cone and foam surround design. Yes it is less expensive, but sound is good. These materials have been used for years. You either like Bose or you don't. I don't consider myself to be a professional audio analyst, but I know what sounds good to me. I have chose to like Bose because of what I have heard. I will continue to use this company in the future and would recommend the Bose 301 to anyone that likes audio. Rock, classical, jazz all sound very nice if properly set up. Hope this helps anyone looking to purchase the 301's! the bose 301 v is the best speaker it has clear sound and clear bass nothing can beat bose NOTHHIINNNGG!!!! I just connected the 301s to my, Millenium Falcon, NAD3240 AMP. I'm pleasantly surprised by the acoustic response. I can now see why some are dissatisfied with the product. In my opinion if Clients are looking to crank up the AMP & 301s with the "duff duff" over produced sound. This speaker may not be for you. I'm now watching Music Vids from HdTv via Amp to Speakers. It's a fantastic sound!!! Last night I watched the Vienna's New Years Concert 2001 on DVD. Please NOTE!!!! The Concert Hall recording was replicated through the speakers!!! The depth, clarity, and range fills the room. I can't wait to crank up later some Rock n Roll stuff that has "minimal" production in it's recording phase. Key Point here. Bose 301s does justice to natural sound. I don't have to alter my Bass or Treble settings on my AMP. Now that's saying something. Great sounding speakers, punchy, efficient, beautiful mids, great sounding vocals & sweet highs, use good solid core speaker cables like Kimber Kable 4VS or better & good interconnects, forget cheap multistrand speaker cable, these speakers open up on good cables & will surprise you, use good speaker stands ! They work great on vintage gear like my Yamaha CA810 & Sony CDP 297 & would sound fantastic on decent modern amps/players. Sure there are lots of precision speakers available with perfect imaging & better top end, but that's not the point, these do exactly what their designer intended & do it remarkably well ! Bass / Trebble / Imagining / Sound Stage. I was more disappointed with listening to the B&W 683. I could tell where the speakers were, and the sound was being fired at you, and was kinda shallow sounding. They were though, not bi amplified and most probably not run in correctly. But I would gladly choose these Speakers of the B&W any day. Needs Speaker Spikes (initial massive jump) + Good Amplification and a Good Source (2nd massive jump). Well I was first disappointed with these speakers to start with. Comming to the conclusion that my speakers were at fault, with poor imaging and poor dynamic range. I have since changed my setup to incorporate an Auzentech X-Plosion soundcard using ASIO4ALL and with 0ms of hardware buffer, having this connected to my Onkyo TX SR605. Not being the most musical amplifier in the world. The speakers have changed dramatically over 100 fold with the upgraded source + Speaker Spikes to stop the resonation feeding too much into the cabinet and providing muffled bass. Bass is now sharp and responsive. The character of the speaker shifts dramatically depending on the music being fed into them. For instance "Beyonce - Summertime" her voice is in front of you during to the chorus and shifts slightly left during verses. While the tones are heard from everywhere and the guitar is slightly left and lower of beyonce's voice. Speakers are blowing me away. The biggest change so far is the source, going from a Creative X-Fi using Entertainment Mode, then switching to Audio Creation mode and selecting bit matched playback with ASIO. Then upgrading to an Auzentech X-Plosion for the HTPC benefits and continuing to use ASIO. Hopefully if you power these speakers well and have a great source. The sum of the parts are greater than the individual components. The speakers really really do shine.